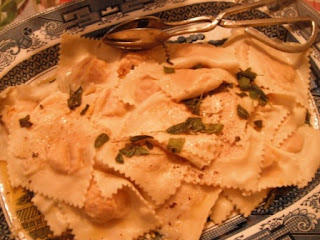 I could just tell that the pumpkin in the food co-op box this week was perfect for Ravioli. It was going to be sweet and dry, just perfect mixed with ricotta cheese for the filling. I halved the pumpkin, scooped out the seed and baked it for about an hour. When it had cooled down I mixed the pumpkin with ricotta and some nutmeg and ground black pepper. I used 250 g 00 flour and 250 g semolina and 4 eggs for the pasta. For those who say life is too short to make your own pasta, I say life is too short not to. Homemade fresh pasta is a completely different product to dried pasta. It does take time, but the great news if you don’t have to go the gym. It’s a real work out. When I make pasta I’m inclined to get carried away with the sauce. Not being a woman of moderation I think more is better – NOT so with pasta sauce. The experts say it should be about the pasta not the sauce. It takes some getting used to but the more pasta I make the more comfortable I am letting it speak for itself. I boiled the Ravioli for 3 minutes and poured over sage butter – Pefect. The photos don’t do it justice.